In a large pot or dutch oven, melt 2 tbsp butter over medium-low heat. When foamy, add the onion, celery, red peppers and salt and “sweat” for 5-7 mins, stirring occasionally. Add garlic and cook 5 more mins until the onions begin to turn translucent. Start the rice- combine 1 cup rice, 2 cups water, and 1 tsp salt. Bring to boil, cover, and let simmer over low heat for 14-15 mins. Meanwhile, slice the sausage and add to a skillet. Turn the heat to medium, and cook, tossing occasionally until browned, about 7-10 mins. 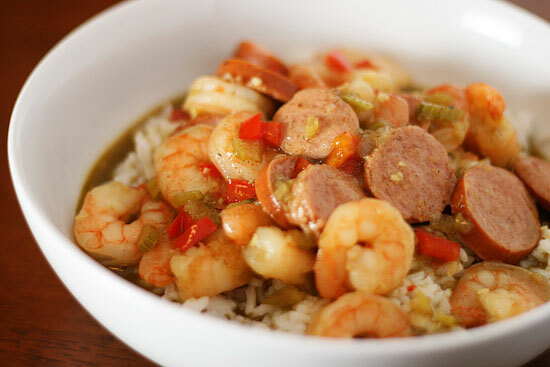 Using a slotted spoon, transfer the sausage to the gumbo. Pour off any excess fat left in the skillet. In the same skillet, melt 2 tbsp butter. When foamy, add 2 tbsp flour and whisk until incorporated and the roux is light brown and fragrant, about 2-3 mins. Add to gumbo, and stir, then add file powder and stir until it is well incorporated. RIDICULOUS MISHAPS: None. Seriously. Stay tuned. I just got lucky this week. MY RATING: FIVE THUMBS UP! RATING COMMENTS: All three kids ate it. Need I say more? But really, there was NONE left and I heard OK, GOOD and AWESOME. That’s a win in my book. I used brown rice, though it did not suggest a particular type and cooked it in my AWESOME MICROWAVE RICE COOKER (because it is hard to fail at that, if you fail at rice like I do, get one). I used 1 1/2 cup of rice to serve 5. I used the WHOLE pound of beef kilbasa sausage instead of just a half because, again, I was feeding five and they like meat. I used water and chicken bouillon (instead of chicken stock) and found it was still a bit runny.